Director – Jan De Bont, Screenplay – David Self, Based on the Novel The Haunting of Hill House by Shirley Jackson and 1963 film The Haunting Written by Nelson Gidding, Producers – Susan Arnold, Donna Roth & Colin Wilson, Photography – Caleb Deschanel, Music – Jerry Goldsmith, Visual Effects Supervisors – Craig Hayes & Phil Tippet, Visual Effects – The Tippett Studio, Additional Visual Effects – Industrial Light and Magic (Supervisor – Scott Farrar), Special Effects Supervisor – John Frazier, Makeup Effects – K.N.B. EFX Group (Supervisors – Howard Berger, Greg Nicotero & Wayne Toth), Production Design – Euegnio Zanetti. Production Company – DreamWorks SKG/Roth-Arnold. Dr David Merrow selects three volunteers for a study in sleep disorder to be held at the forbidding Hill House. What none of them know is that Merrow is in fact studying fear and group hysteria and once there seeds them with horror stories about the house’s original owner Hugh Crain. Shy and unworldwise Eleanor Vance is then subject to a series of terrifying supernatural apparitions, although the others doubt these. Eleanor realizes that she is being drawn to help free the tormented souls of the children from his mills that Crain kept imprisoned in the house. The Haunting (1963) is one of, if not the, greatest of all horror films – a haunted house story where all the ghosts exist inside the audience’s own head, where nothing is seen, everything entirely suggested. I first saw the film in my early teens and it left an indelible impression on me – scenes like when Julie Harris wakes up the following morning only to find that her friend, whose hand that she spend the entire night clutching in fear, was not in her room and the spooky question is left as to just whose hand she was holding. Or the terrifying image of the team of researchers huddling in fear in the dining room whilst a vast never-seen force booms up the hallway and pounds against the door, stretching it inward – something that director Robert Wise’s refusal to show exactly what is on the other side of the door makes all the more terrifying. A remake of The Haunting was announced several times throughout the 1990s, most promisingly under director Wes Craven. It finally emerges here under the hand of Jan de Bont. The Netherlands-born de Bont, a former cinematographer on films like Die Hard (1988), The Hunt for Red October (1990), Flatliners (1990) and Basic Instinct (1992), became a director with mega-hit Speed (1994) and followed that with the likes of Twister (1996), Speed 2: Cruise Control (1997) and Lara Croft, Tomb Raider: The Cradle of Life (2003). Whereas The Haunting 1963‘s director Robert Wise had received exemplary tutelage under Val Lewton, producer of classic works of psychological horror like Cat People (1942) and I Walked with a Zombie (1943), for whom Wise directed The Curse of the Cat People (1944) and The Body Snatcher (1945), Jan de Bont comes to the remake by way of 1990s blockbuster action and CGI box-office spectacle. Speed, for all the big hit it was, was a vehicle that existed entirely as hurtling action-movie kinesis and no-brain – the action sequences were ridiculous to consider of as ever taking place in the real world. De Bont made things even more loud and empty with the universally excoriated Speed 2. Twister on the other hand was an enjoyable CGI vehicle when considered purely in terms of a series of disaster spectacle scenes each trying to outdo the previous. It is the contrat between Robert Wise, a director who trained in the school of psychological horrors under the acknowledged master of the genre, and Jan de Bont, a specialist in mindless action and large-scale CGI effects sequences. Unfortunately, this contrast between the two directors spells out only too clearly the fatal gulf that exists between The Haunting 1963 and The Haunting 1999. One is the greatest of all horror movies and the other a remake of epic miscalculation whose ignominious despoliation of the original lurks somewhere up there alongside the Dino De Laurentiis King Kong (1976), Diabolique (1996), Gus Van Sant’s Psycho (1998) and The Wicker Man (2006). The Haunting 1963 was an epic of psychological understatement; The Haunting 1999 is an epic of overstatement. Subtlety and suggestion have been entirely replaced by CGI bombast. The difference can surely be told in the very first scare scene, which manages to dispense with all the original’s major highlights – the pounding footsteps, the hammering at the door by an unseen force, noises heard while the heroine huddles in bed and the cold spots – in five minutes flat as only its opening movement. There are some of this version’s scares that occasionally, had the film not had such an eminent pedigree, been passable – phantom cherubs sneaking under blankets, faces forming on the frost on the window. However, the show slowly spirals downwards into the utterly silly with scenes of glass cupolas transforming into glowing eyes; Lili Taylor’s bedroom collapsing around her and pinning her to the bed as though by wrought-iron tentacles; decapitation by giant lion-headed iron chimney flues; the cast batting off iron gargoyles; giant hands reaching out of doors; statues coming to life and stone hands trying to drown Liam Neeson; exploding cars; a skeleton popping up into the camera like a jack-in-the-box; and a climax with Hugh Crain as a giant angel of death figure emerged to confront Lili Taylor. Needless to say, the psychological suggestion of the original is nowhere to be found in this version. Further, the subtlety of Shirley Jackson’s original novel that both films are based on is junked with a screenplay that needs to explain everything. There are occasional moments where the updating works – the opening is more potently rewritten where instead of merely unhappily living with her sister and her husband and fighting over borrowing the car, Eleanor and sister are battling over her mother’s will probate. One holdover is that Theo is now much more openly bisexual – making references to being caught between her boyfriend and her girlfriend – but this is there to astonishingly little point. The middle of the film drags the story to a standstill to introduce a backstory about Hugh Crain having imprisoned children from his mill in the house. The ending turns into a laughably banal wrap-up wherein Eleanor discovers she is (yes!!!) Hugh’s grandchild and becomes the deliverer of the children’s ghosts, Hugh’s ghost is dragged down to Hell to be judged and Eleanor dies and her spirit is seen going off into a glowing hereafter. It is a far cry from the ending of the first film, which subtly altered the opening narration to imply that the house had now found peace as a result of Eleanor’s sacrifice. Lili Taylor gives a strong performance, which helps the film a good deal. Marian Seldes also makes for an effective Mrs Dudley, although Bruce Dern does his bug-eyed thing to little effect as Mr Dudley. 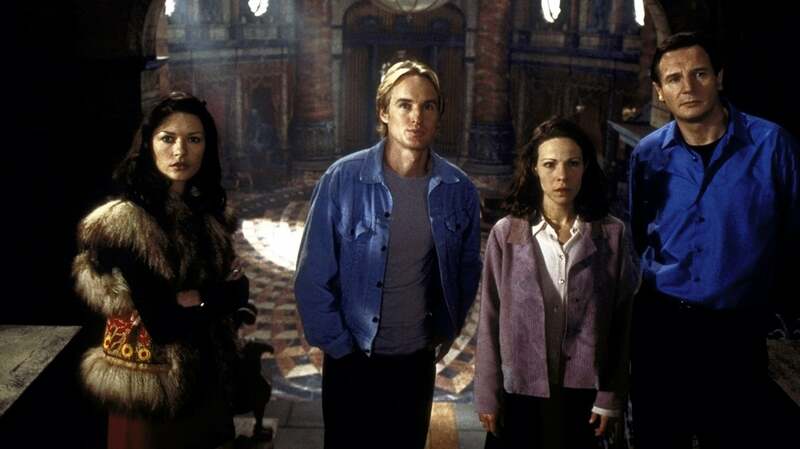 Liam Neeson offers little and Catherine Zeta-Jones struts campily, overplaying the cat-suited Theo part. 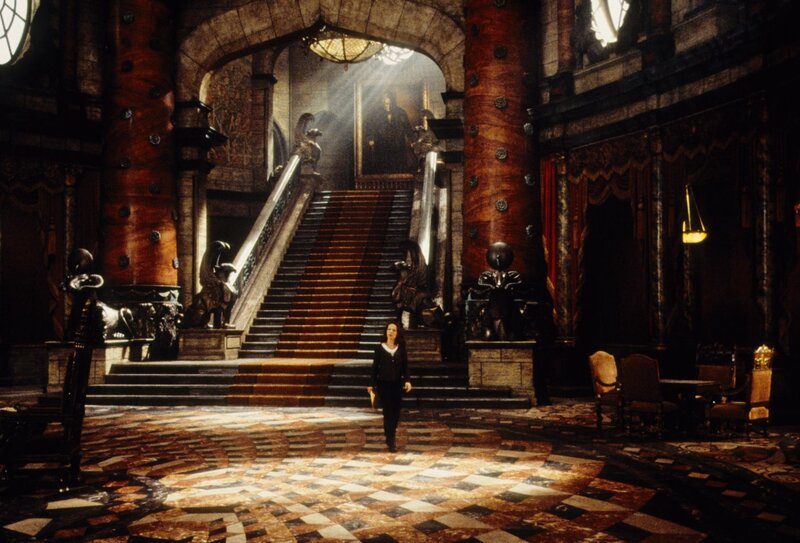 Certainly, the house is an amazing work of production design – corridors running off into curved perspective, giant decaying conservatories, indoor merry-go-rounds, halls that have been flooded and where books are used as stepping stones, giant doors with carved murals of cherubs. If nothing else, the set designers have determined to impress at every opportunity. Although, in their determination to make the house seem oppressive they have created a massive Gothic folly that it seems a hard stretch to believe that anybody would actually want to build. The film is an exercise in bad miscalculation. Anything that made the original work has been thrown out in favour of flashy CGI effects. Behind this has been the assumption that a film of psychological subtlety that shows nothing overtly would be of no interest to today’s audiences. However, as The Blair Witch Project (1999), which opened in wide release one week after The Haunting (and ended with far more seats filled per theatre than The Haunting) demonstrated, not to mention the amazing runaway success of The Sixth Sense (1999) a few weeks later, the audience for psychological unseen horrors was far from dead. It is a demonstration that shows that The Haunting‘s presumption of an audience lowest common denominator is only ignorance and crassness and one that for its trashing a classic should be treated with the utmost contempt. The original was further remade as the excellent tv mini-series The Haunting of Hill House (2018), which substantially rewrites the story. 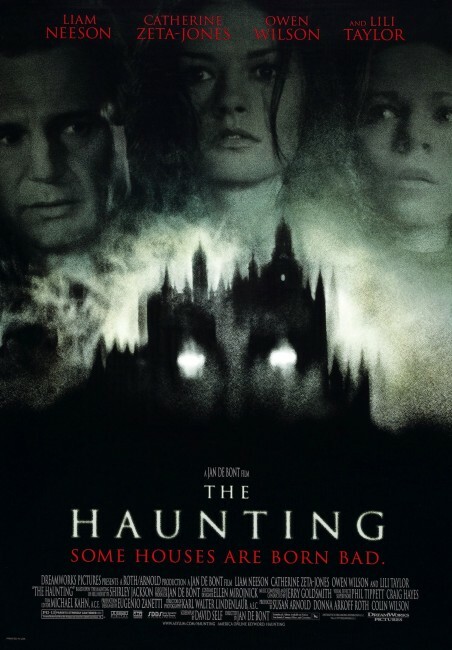 The Haunting was spoofed in Scary Movie 2 (2001). (Winner for Worst Film in this site’s Top 10 Films of 1999 list. Winner for Worst Sequel/Remake, Nominee for Best Production Design at this site’s Best of 1999 Awards).